Not long ago we reviewed the highly refined 2017 Polaris Sportsman XP 1000, a sport utility ATV with a breathtaking level of performance. For general trail riding, the XP 1000 is insanely fast yet surprisingly manageable for an experienced rider. Incredibly plush, long travel suspension, excellent stability, and Polaris power steering do a very good job of allowing you to harness the machine’s over-the–top power and substantial weight. 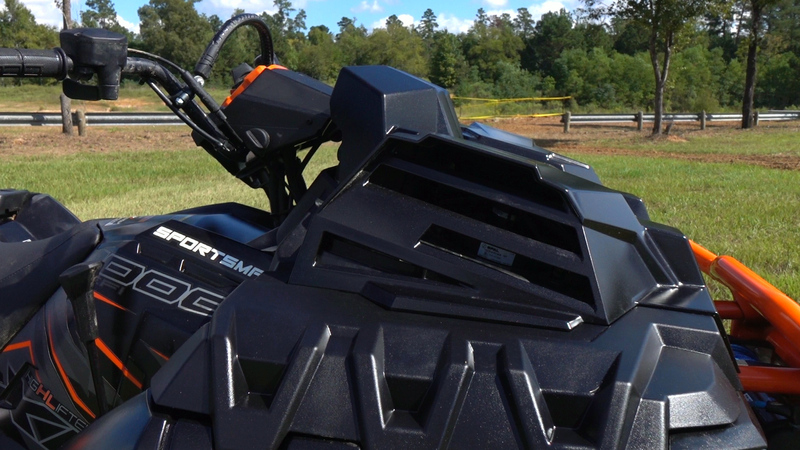 While the Sportsman is an amazing all-terrain vehicle, if you want your ATV to excel in the deepest mud and last, it’s going to take a machine somewhat more specialized, like the 2019 Polaris Sportsman XP 1000 High Lifter Edition. Polaris recently invited us down to the High Lifter Proving Grounds in Shreveport, La, to put our mud riding skills and the 2019 High Lifter Edition to the ultimate test. Based on the standard Sportsman XP 1000, the High Lifter Edition features a number of changes and upgrades to make it a purpose-built mud machine. 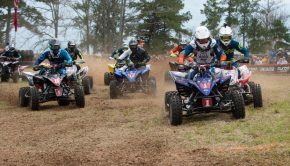 Polaris wisely partnered with High Lifter products, experts in turning ATVs in mud machines for over two decades, to help develop the High Lifter Editions. 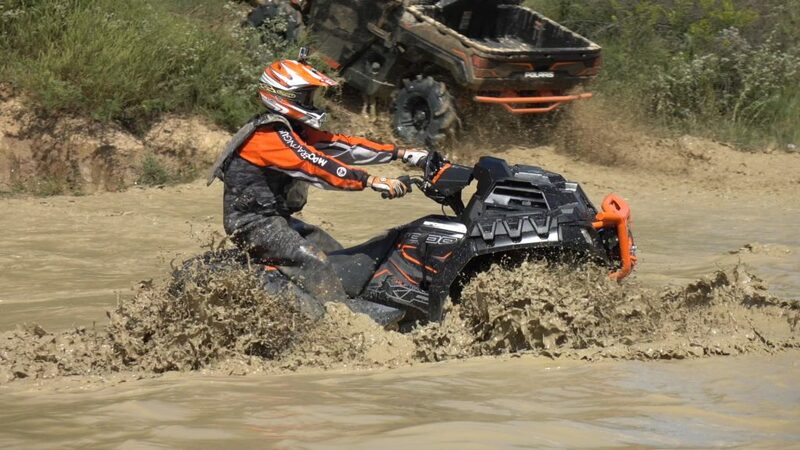 According to High Lifter Owner, Scott Smith, they work with Polaris on tires, waterproofing, and suspension, which he says are the three keys to building a really solid mud unit. The beginning of building any mud machine typically starts with the tires. 29.5×9.5-14 High Lifter Outlaw II tires are mounted on 14” cast aluminum rims compared to 26-27 inch tires on the standard models. From there, Polaris seemingly built the machine around the mud and the larger tires. It shares the same 852cc, parallel-twin, ProStar engine as the standard Sportsman, putting out 85hp as tuned for the High Lifter Edition purposed for mud; Active Descent Control wasn’t equipped. A mud specific CVT transmission features higher gear ratios in both low and high ranges, effectively gearing the transmission down to accommodate the larger tires. Stronger front drive and half shafts were carried over from the standard 2018 Sportsman. The all-wheel-drive system has a 1:1 drive system on the High Lifter Edition, eliminating virtually any traction loss from the rear tires breaking loose before the front tires lock in and start pulling. Airbox and clutch intakes, plus the clutch exhaust vent, are located up by the handlebars helping keep water out. The radiator was relocated up top where the front rack used to be. The air intake and belt boxes are designed to be water right. Airbox and clutch intakes, plus the clutch exhaust vent, are located up by the handlebars helping keep water out. The radiator was relocated up top where the front rack used to be. It features inverted cooling fans designed to push debris away from the radiator. A quick access radiator cover allows for easy cleaning. In addition to an already relatively water-resistant electrical system, the sealed fuse box has been mounted high in front of the radiator for easier servicing. 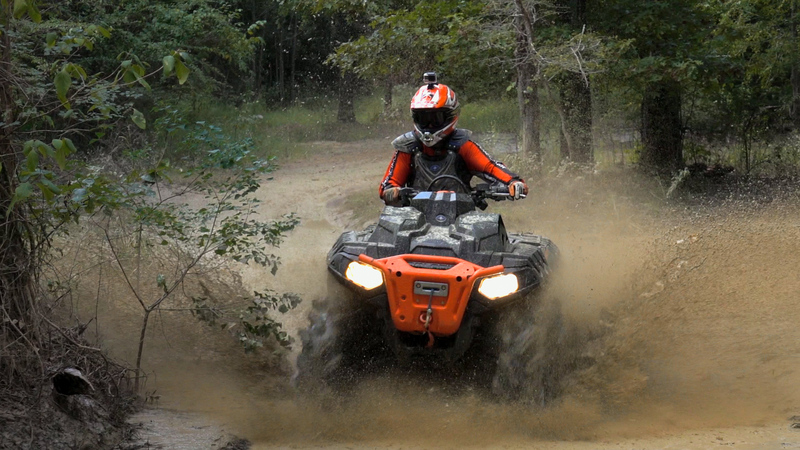 Polaris added a number of other features specific to the High Lifter Edition to make it a more capable mud machine. Polaris’ Extreme Duty front mud bumper features integrated tow hooks and comes complete with a heavy-duty 3,500lb Polaris winch. It’s mounted high to help keep your hands out of the mud. There’s a bumper mounted out back for added protection and to make it easier to tow your friends out. A grab handle was added to the top of the handlebars to help provide leverage over the machine for mud wrestling. The foot wells feature cutouts in the back allowing water and mud to drain away more easily. 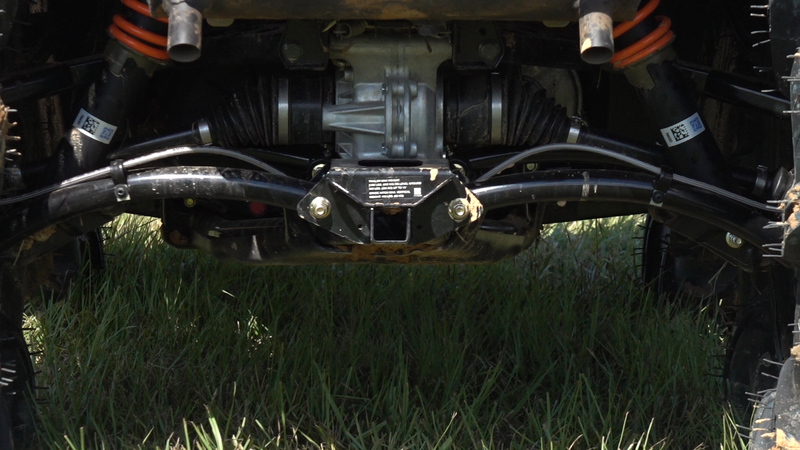 High Lifter works with Polaris on the lower A-Arm design to provide maximum ground clearance in deep ruts. Suspension at both ends has been recalibrated to deal with the additional weight of the ATV plus the substantial added weight of being packed with mud. The heavier springs are setup to keep the machine riding high in the travel maintaining ground clearance. Suspension travel is reduced to 7.4” front and 6.7” rear to accommodate the larger 29” tires. 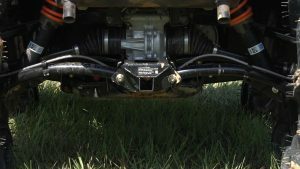 Polaris opted to remove the rear sway bar to free up the rear suspension for improved articulation in deep, uneven ruts. The steering stops were altered keeping the front end from turning quite as sharply to prevent tire rub. 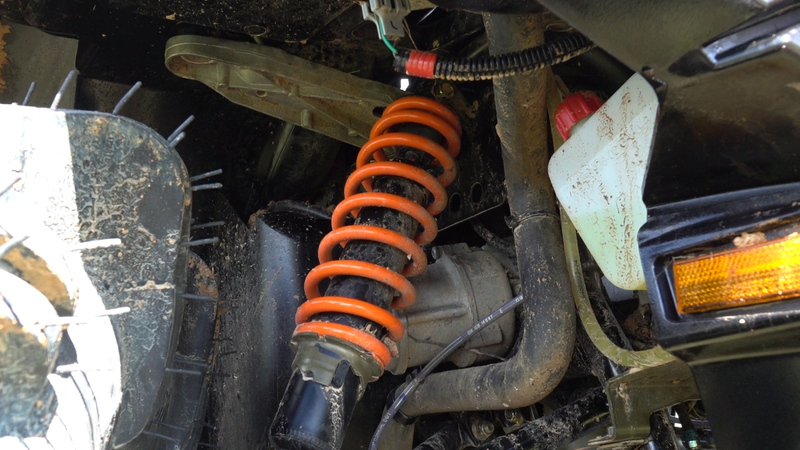 The heavier springs are setup to keep the machine riding high in the travel maintaining ground clearance. Suspension travel is reduced to 7.4” front and 6.7” rear to accommodate the larger 29” tires. Larger tires result in slightly larger dimensions overall, at 88” long, 49” wide, and 52” high making the High Lifter Edition 4.75”longer, 1.4” wider, and 1.25” taller, but most important, is the 2” increase in ground clearance to 13.5”. With all the added features and larger tires, the High Lifter Edition gained 1691 pounds weighing in at 976 pounds. Its heft is slowed by four-wheel hydraulic disc brakes controlled by a single handlebar-mounted lever and separate rear boot brake. The sportsman’s rear rack can haul 75 pounds of cargo. There’s the same 2 gallon rear storage found on the standard Sportsman 1000 models, and the 1.25” hitch receiver can tow 1,500 pounds in case you want to drag something through the mud. With Polaris machine in hand and their staff there to back us up, we were free to cut loose on the High Lifter Sportsman. As a mud machine, the High Lifter Edition is amazing while retaining enough dry land performance that it remains fun to ride between mud holes. 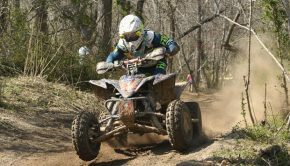 Attacking the mud-strewn trails, the engine has zero problem lighting up all four wheels, seemingly catapulting the quad out of the mud and across the top of the terrain––explosive when you want, yet surprisingly controllable. 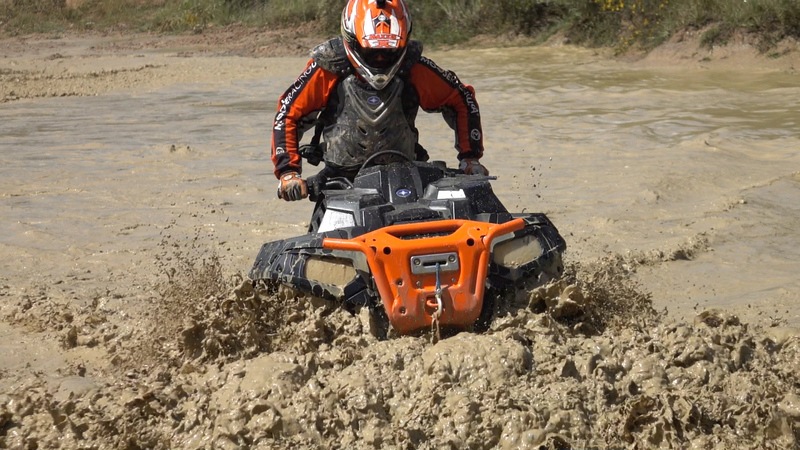 Former pro desert racer, Ed Teixeira, was easily able to wheelie the machine across a huge, muddy pond that was several feet deep. Deep in the mud, it’s surprising how much affect your body weight adds to a machine that weighs nearly half a ton. Riding on the rear wheels, you lean from one side to the other for directional control. Whether the bottom of a the hole was hard or soft, High Lifter Outlaw II tires don’t seem to run out of traction unless you manage to run it out of ground clearance. Even then, a little tugging and some enthusiastic body movement is often all that’s needed to regain traction and momentum. The wrap –around tread is extremely beneficial in deep ruts. While definitely a mud tire, the Outlaws don’t ride unbearably rough on dry surfaces. Directional control is great in the muck and acceptable in the dry. 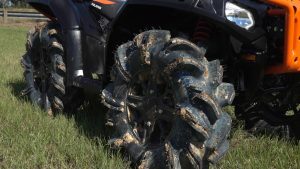 Whether the bottom of a the hole was hard or soft, High Lifter Outlaw II tires don’t seem to run out of traction unless you manage to run it out of ground clearance. Although suspension travel was shortened a bit to 7.4” front and 6.7” rear to make room for the 29” tires, the big tires roll over many smaller bumps leaving the suspension to deal with what’s left. While not quite on par with the standard Sportsman, the ride was surprisingly plush with hits of various sizes well dampened. Without the rear sway bar, the ATV still feels pretty composed cornering on dry ground. Polaris power steering is awesome at low to intermediate speeds. It keeps steering super light and helps shelter the rider from jarring kickback through the steering in the ruts and obstacles. As usual, we found it a little too light at higher speeds, which you won’t typically be at on a mud machine. Polaris power steering is awesome at low to intermediate speeds. It keeps steering super light and helps shelter the rider from jarring kickback through the steering in the ruts and obstacles. We had our 2017 Sportsman up to 78mph and pulling. The rev limiter kicks in seemingly somewhere in the upper 50s on the High Lifter Edition, which seemed plenty fast for a machine rolling on nearly 30” mud tires. The brakes offered ample power and good feel. 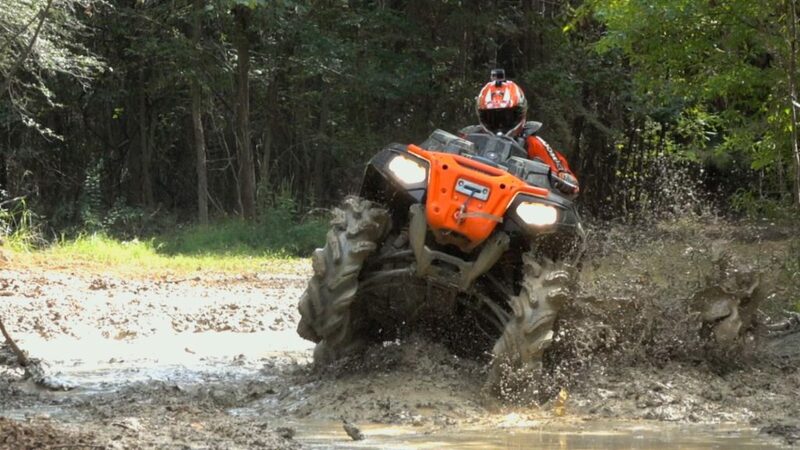 There are thousands of products out there that will help turn your 4×4 ATV into a dedicated mudder. However, you’re going to work awfully hard and spend a lot to build a better machine than the Polaris Sportsman XP 1000 High Lifter Edition as it sits on the dealer’s showroom floor due to Polaris’ ground up approach to building the ultimate ATV for the mud. If the 1000’s $13,999 asking price is a bit much, you could go for the 850 at $10,099, although it gives up the bumpers, winch, and other smaller items found on the 1000, not to mention that it won’t be a 1000. 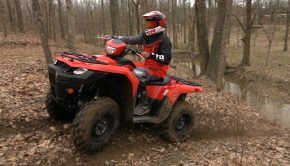 While we could easily recommend that most riders looking for a multi-use ATV might do well to consider a Sportsman 850, you really can’t have too much power when it comes to turning big tires in the deep stuff. At this point, we can’t imagine asking for a higher level of performance, capability, and excitement in the mud than the 2019 Sportsman XP 1000 High Lifter Edition delivers!